This baked salmon dish takes about five minutes to prep and less than 15 minutes to cook. The salmon bakes in a flavorful honey mustard sauce made with simple pantry ingredients and some fresh dill. This recipe serves three, but can easily be stretched to serve four if you have a side dish or bread. In a small bowl, combine the mustard, honey, dill, lemon juice, salt, pepper, and garlic pepper until smooth. Place the salmon on the baking sheet skin side down. Pour the sauce over the top. Bake the salmon for approximately 10 to 12 minutes or until it flakes easily with a fork. Depending on your oven and the size of your salmon you may need to adjust the cooking time. I recommend checking the salmon a few times while it bakes. 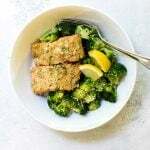 I served mine with some steamed broccoli with lemon juice and parmesan, but my roasted green beans or lemon-honey glazed carrots would make a great side dish, too.